Rev. Jesse Jackson: "Killings keep coming ... we must declare a state of emergency"
Albert's mother, earlier in week: "I can't believe ... he's not with me"
CHICAGO, Illinois (CNN) -- The funeral of a Chicago teenager whose beating death was caught on video was attended Saturday by scores of family members, officials and community leaders, including the Rev. Jesse Jackson. 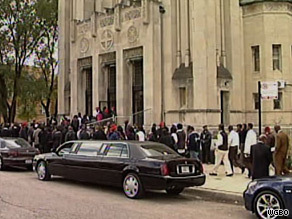 A funeral for Derrion Albert, a teen who was fatally beaten last month, was held Saturday on Chicago's South Side. Authorities say Derrion Albert, a 16-year-old honors student, was an innocent bystander who ended up in the middle of a September 24 street fight between two factions of students from Christian Fenger Academy High School. "The killings keep coming -- one need not to be guilty to be killed in this war zone," Jackson told reporters before the service Saturday at the Greater Mount Hebron Baptist Church in South Side Chicago. "We must declare a state of emergency. We have an obligation to prepare for our children safe passage." "I can't believe I'm here and he's not with me," An-Janette Albert told CNN in an interview earlier in the week. "I can't talk to him." Four suspects have been charged with first-degree murder in Derrion Albert's killing, and police say they are looking for three more people in connection with the beating. Video footage of the incident shows Albert being hit by a person wielding a railroad tie. President Obama, a longtime Chicago resident, is sending Education Secretary Arne Duncan and Attorney General Eric Holder next week to talk with officials from the school, the students and the community about school violence, the White House said. Albert's sister, 11-year-old Rhaea, told CNN on Thursday that she looked up to her big brother, and now wants to be an even better student in his honor. But his death haunts her. When school let out at 2:50 p.m. on September 24, Albert was nearly six blocks away -- on his way to a bus stop -- when two groups of students converged on the street, said Tandra Simonton, spokeswoman for the Cook County prosecutor. The factions -- one that lived near the Altgeld Gardens housing development and one in an area known as "The Ville" -- began fighting after an earlier shooting that police called gang-related. According to Simonton, Albert was approached by two members of "The Ville" faction and struck in the head with a long wooden railroad tie, then punched in the face. After being knocked unconscious for a brief period, Albert regained consciousness and tried to move from the fight, but was then attacked by a second group of five members from the opposing faction, Simonton said. Albert was taken to Roseland Community Hospital and then to Advocate Christ Hospital and Medical Center, where he was pronounced dead.